As the train starts down the track we look out our window to see the countryside rolling by. Unfortunately this year it is not covered in a glistening blanket of white fluffy snow. The Christmas carols are sung by the Santa's elves and a few passengers join in myself included but only at a volume that my daughter and I can hear. Then Santa comes out or at least someone dressed as Santa because inevitably some child will call out that's not the real Santa his beard is fake. Some of the younger children start to cry because they are frightened by the man in red. After Santa leaves our car we make our trek to the food car to get some snacks, of course that takes us through the gift car. We purchase a train whistle get our snacks and go back to seat. We drink our Hot Chocolate and eat some cookies but instead of relaxing to the clack-clack of the rails I am treated a cacophony of toy train whistles and the voices of sugar charged kids. At the End of our trip it is not quite the Hallmark holiday special I had planned but I did get a few good pictures to remember the day and my daughter had fun. This year I am determined to get a little closer to the idea. Have good directions and a map of where you are going. Warm Clothes (To make Standing around waiting to get on the train or walking around afterwards more enjoyable) Dress in layers. A Small Blanket for Snuggling up especially if the cars aren't too heated. Some Tips to make the Santa Train Ride picture perfect. Pick a good place to go. While there are many Santa trains I find that a ride on a old fashioned steam train can be a better choice for creating that memorable moment than getting on a NJ Transit commuter train, also the old steam trains make that cool Whoo-Whoo sound. What route will the train take - Is is Scenic country side or an Urban, graffiti strewn route. Go with friends and family - The more the merrier as long as everyone gets along and is in the holiday spirit. It takes only one Scrooge to ruin the day. Keep positive, hope for a coating of Snow and enjoy the day. Here are some Santa Train Rides and Other Holiday Rail Events. Strasburg, PA - A little far but a nice weekend trip if you can find the time. During the approximately 90 minute ride the Santa Claus will Ho Ho Ho his way through the train and visit each child giving them a special gift from his bag. In addition each child can have their picture taken with Santa Claus so they can always remember their ride, so bring your cameras. On board will be Mrs. Claus and several other surprise cartoon characters sure to entertain the kids and make for a great day out for all on board. 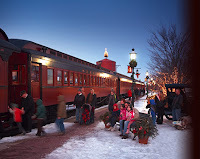 Santa Train Ride departs weekends in December from Lehigh Junction located in the Historic Main Street area of Phillipsburg New Jersey. 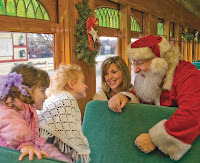 This ride features a visit from Santa on the train Website: 877trainride.com or call 1-877-train-ride. Winterfest has been a tradition in East Windsor for many years and a favorite of museum visitors of all ages. Some visitors return every year from all over the area to see the museum all decked out with holiday spirit. Ride through the Tunnel of Lights on the electric sleigh, or choose an enclosed heated trolley. Don’t forget to visit Santa in the Visitor Center, where he’ll be holding court among the exciting model railroad displays.